Pendaflex SureHook Hanging Pockets PFX09213 $19.61 Hanging Pockets offer extra capacity and SureHook technology with revolutionary, built in tension springs. This design makes sure pockets stay on track, slide more easily and don't buckle under pressure. 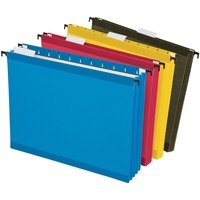 Full height, expandable gussets prevent folders from getting caught on folder rails. Three sided construction protects letter size documents and assures papers stay in the folders. Tear drop slots on front and back panels accept tabs not included in five positions. Folder is made of 11 point paper stock and expands 3 12. The top of the folder is reinforced with polylaminate for added durability. Assorted colors include one each of blue, red, yellow and standard green.